I have made two road trips in the last five days. Both were for family events, one happy, and one very sad. My nephew (my mother’s youngest grandchild) had his First Communion on Sunday. It was a lovely occasion and a good reason to take my aging mother on a road trip. It means so much to her to spend time with her grandchildren, and some are farther away than others so we work to make that happen. Mom still drives at age 84 and does pretty well with it. She drives around her own town, and easily makes the half hour trip to my home. But anything more than an hour behind the wheel has started to make her a little nervous. So she looks for a designated driver and often that’s me. I have no problem driving my mother places. It’s the least I can do for her. She raised five children and we ought to be good for something, right? So we help her out with a few things here and there, and I seem to be the one behind the wheel most often. My nephew’s First Communion was about 175 miles away: about 2½ hours all on Interstate highways and pretty easy driving for me. Then, just a day before we were prepared to make that trip, my aunt passed away. She lived 250 miles away, almost five hours in the car through forest land and over a lot of mountains. So I said to my mother, “We can make both trips, but are you sure that you’re up to it?” Again, she is 84. But she was certain that she wanted to make both trips. So we did. We had a nice time with my sister’s family, helping to celebrate her son’s big step in his religious upbringing. Then we drove home where we spent one night, before I picked her up the next morning for the longer trip to see my uncle and cousins and pay our final respects to my aunt. That trip was definitely more emotional, as it is always hard to say goodbye. My aunt was a vibrant woman with a huge heart, a sly smile, and a lilting laugh. She was my father’s only sister, and my mother’s only sister-in-law, so we were all there: my mother, my sisters, and my brother and sister-in-law. It was important to us to be there to say goodbye to our much-adored aunt, and to remind her remaining family that we will always feel connected to them even without her physical presence. The trip home was not as easy. We took a much longer route in order to avoid torrential rains and extreme flooding in parts of central Pennsylvania. Taking this longer route left me thinking about a lot of things; mainly about how our life journeys are all different but generally lead to the same end. 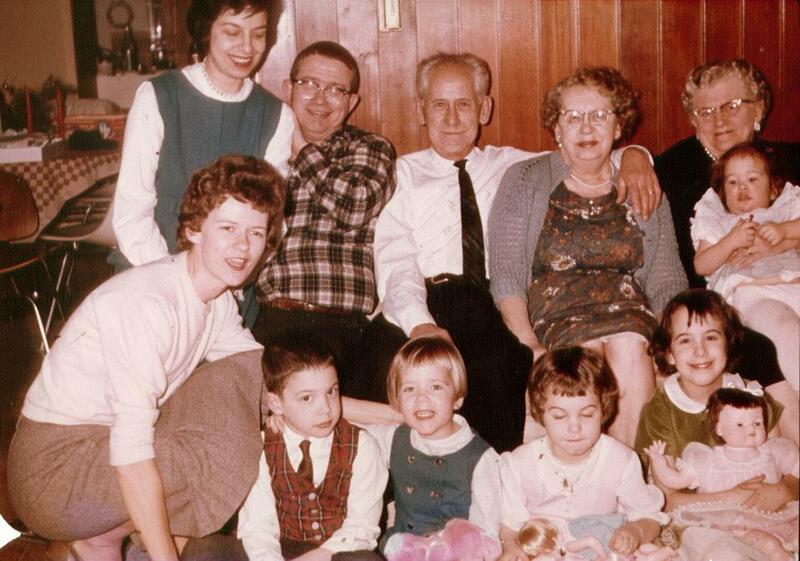 The family, at Christmas 1963. My aunt is at the front left. Most of us take the long road in life. We grow up and grow older before we even know it has happened, yet the look back sometimes feels like a long one. We sat around with my cousins after the funeral, reflecting on our times together as children and our shared experiences. My mom and my uncle chimed in here and there, recalling some details from time to time and reminding us of events we hadn’t considered. My aunt had suffered from cancer for over a dozen years. She fought that wretched illness very hard, unwilling to leave her family any earlier than she had to. She lived to see her eldest granddaughter marry, and to see the arrival of two great grandchildren. She lived her life to the fullest, traveling and spending time with family as much as she could. She took the long way home. My mom is doing the same thing. She wants to be with her family during this leg of her journey. For now, I am her sometimes chauffeur. And while her backseat driving really pushes my buttons, I bite my tongue and try to ignore it, because she is an octogenarian and getting closer to finding her way home. We hope it will be a long way off, but we never really know for sure. These back to back trips were important for our family, and the events themselves are analogous to our life journeys: from beginning to end we follow our own path. And if we’re lucky, we take the long way home. Life is often too short. It’s too short to maintain all of the friendships you should have nurtured. It’s too short to tell people how much you care about them. It’s too short to spend meaningful time with people. And the real irony is that we only recognize these things after someone is gone. This past week has brought the issues of life and death to the forefront. An old friend passed away today. She was a classmate in school and one of the sweetest, kindest people ever. We had not been in close touch in recent years, but had seen each other in passing frequently and talked about our families and lives. Knowing that she was dying has made me think back to our school days many years ago. We often sat together in the library during study hall, pouring over magazines and dreaming about our futures. She went on to marry her high school sweetheart and raise a family. We drifted apart. A neighbor also passed away this past week. We were not close friends, but living just a few houses away you get to know a little bit about each other. He was just a few years older than me, was friendly and family-oriented, and suddenly he is gone. We won’t wave to him in passing anymore, or pause to chat while taking a walk. Death brings the brevity of life into sharp focus, and forces us to reconsider the things that really matter. Family. Loved ones. Togetherness. I have had these feelings before while mourning other losses: my father, my aunt, my grandparents, and other friends. Our lives are formed by the people who surround us. When one of those people dies, we have a natural desire to gather with others. Circle the wagons. Rally the troops. Bring people together. It is true that death is a natural part of life. It is also true that when it’s someone your own age you always feel as though they were too young, with too much of life left unlived. But who’s to say how much is enough when it comes to life? Only God can make that decision, and we are left to decide how to cope. For me, I choose to live whatever life I have left with the people who matter most. I choose to make time for loved ones and to spend time in purposeful pursuits – trying to make a difference for my family, friends, and community. That’s all I can do to honor the memory of those who have gone. I just pray there’s still enough time.